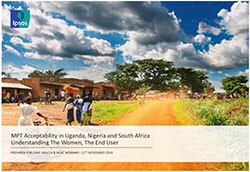 This webinar summarized methods and key findings from the market research study conducted by Ipsos Healthcare, with support from the Bill & Melinda Gates Foundation, to assess the acceptability of MPTs among women in Uganda, Nigeria and South Africa. The key objectives of this research were 1) to understand women in Uganda, Nigeria and South Africa in relation to sexual behavior, contraceptives and HIV, and 2) to gauge the level of acceptability for four potential MPTs (Injectables, Implants, Intra-vaginal Film, Intra-vaginal ring). To learn more about this research, click here to read the reports from this work. This live webinar was co-hosted with AVAC, and featured Moushira El-Sahn and Jeff Lucas of Ipsos Healthcare. El-Sahn, M. & Lucas, J.